Choosing a name for any pet can be a challenge, and pot-bellied pigs are no different. Some people like to get to know their new pet's personality prior to deciding on a name while others have made up their mind before even seeing them. A trend in pot-bellied pig naming involves incorporating food items that we consume from pot-bellied pig cousins, but some people don't find it as humorous as others. Regardless of your preferences, you shouldn't have any trouble choosing a name after reading through this list of ideas. Pigs are amazingly versatile characters. Some are villains, some are heroes, some are sweet, and some are bossy. A few famous pigs are messy, others are fashion-minded, and some are just plain gross. You'll almost certainly find at least one well-known pig in this list that reminds you of your own pet! Miss Piggy: Miss Piggy needs no introduction! Pumbaa: While not strictly speaking a pig (he's actually a warthog), Pumbaa is a well-beloved pig-like character from Disney's Lion King. If you're still having trouble choosing a name for your pot-bellied pig, a little research will give you a whole universe of piggy monikers that come from stories and myths. 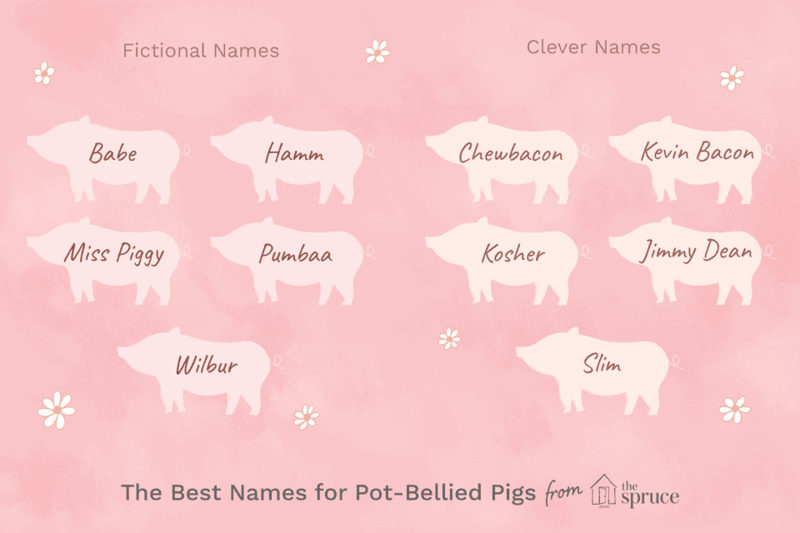 Now that you've named your pet pot-bellied pig, you'll need to teach it to respond when you call. Pot-bellied pigs are extremely smart (like dogs and primates) and will learn their name on their own if you consistently call them by their name. Avoid using a lot of nicknames when trying to teach your pet its name and use positive reinforcement. Positive reinforcement can be in the form of verbal praise, petting, and treats (pigs are very food motivated). If you decide to use a treat to train your pig, make sure you are consistent and give them a treat each time you call their name if they come. Say its name in a higher pitched, happy voice so your pot-bellied pig is more likely to respond to you. Low-fat and healthy but tasty treats are a must during this training session to avoid making your new pig gain too much weight. Try Cheerios, puffed rice, or baby snacks such as Gerber Graduates Puffs to have your pot-bellied pig running when you call out its name. Why Is My Male Pot Bellied Pig Leaving Wet Spots Behind? What Should You Name Your Guinea Pig? What Should You Name Your Hermit or Fiddler Crab?